Yesterday I attended a screening of Into Great Silence (Philip Gröning, 2005) at the Edinburgh Filmhouse. Playing in a packed cinema 2, projected on 35mm, the film had the audience sat utterly rapt, caught up in the atmosphere of near silence and awe. It was the kind of cinema experience you hope to have every time you enter the auditorium, but one that is sadly sporadic. I’ve written about this type of unique communal joy in the darkness before on my blog, and I certainly felt it seeing Béla Tarr’s The Turin Horse (2010) at EIFF this summer, but Into Great Silence seems to be congealing somewhat inside me, so I felt the need to ponder over its lingering effect. The idea of the movie theatre being akin to something religious, reverent is not an original one. Terence Davies talks of the influence of Catholicism in his work, favouring symmetrical framing and use of light that echoes the alter and stained-glass windows, not to mention the use of characters singing perhaps signalling a choir of angels. In his documentary, Of Time and the City (2008) his velvety voiceover speaks of cinema replacing religion in his life; this is certainly an experience I can relate to as well. Do we all need something to fixate on? Do we need something to be completely passionate about? If this is God for some, it may be cinema, and the movie-theatre, for others. 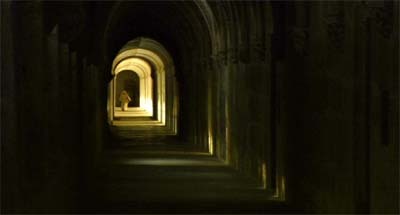 The spectator in a “dark room” is, on the contrary, a passive subject in a pure state… for the spectator, deep in his cell, a monad closed off to everything except the screen, enveloped in the double placenta of an anonymous community and obscurity, when the channels for action are blocked, then the locks to myth, dream, and magic open up. Of course in the age of 3D and live satellite broadcast, most of the time the spectator cannot be considered to be closed-off, (especially if they’re of the type to check their phone in the cinema). However, I feel Morin’s description is highly applicable to the type of experience I had seeing Into Great Silence. Of course, I can’t ignore the subject of the film as a contributory factor: a near three-hour documentary, with no commentary, observing the almost completely silent day to day lives of the inhabitants of the Grand Prior of the Carthusian Order, a monastery high on the French Alps. Adjusting myself to the pace of the film, the audience and I seemed to slip into a meditative state, colluding with the cyclical rhythm of the film, our mutual appreciation made apparent when the image-switched to slapstick – monks sledging provided a small release of hysteria amongst the ‘congregation’. Reverence therefore, can still be felt at the cinema. At a screening of his film The First Movie, Mark Cousins declared he felt cinema to be incredibly reverent, and if you’ve seen his The Story of Film: An Odyssey on More4 you will know that his musical voice-over drips of this sentiment in every word. I wonder if others have had experiences like this in the past decade? In the 1990’s Susan Sontag declared the decay of cinema, but I think that we have now come back to an age of wonderful, exciting films. Even despite the financial restrictions that all artists face, cinema worthy of reverence is still being created, at least that’s what I believe.